Another end of the week, another Food Truck Fridays post! This week I tried out the pizza from Valducci's Pizza truck. They have many options, and they don't cost a lot of cash. I settled on the Sicilian slice, aka the Big Boy, for a whopping four dollars. Cheap Eats! This was a gigantic slice, a rectangular bounty of carbs that dangled dangerously over the edge of the paper plate. I shared some with a coworker and still had plenty left for me. My slice--minus the bit I sliced off for M! 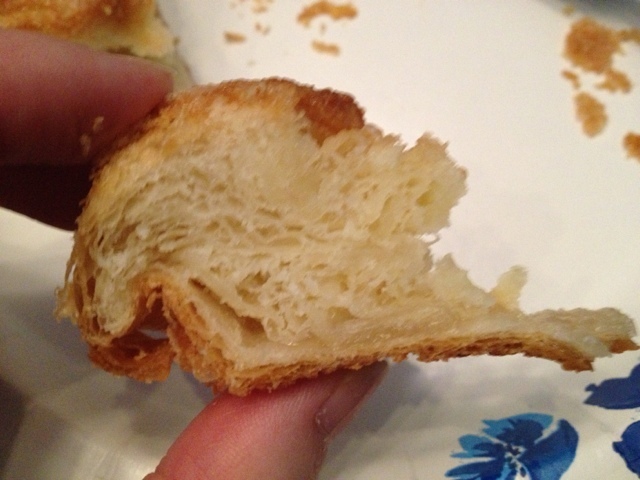 The crust, thicker than regular slices, and my favorite part of the Sicilian, had just enough bite and chew to it without being TOO chewy. The sauce was garlicky and oh-so-scrumptious. For one truck, Valducci's carries an impressive amount of options. I'll be sure to try something else the next time, but the Big Boy gets two saucy thumbs up from me! 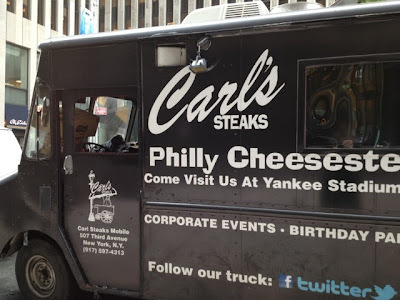 You can usually find the truck on 50th street between 5th and 6th, or somewhere nearby, thought they might also be in the Meatpacking District on certain dates. The best way to track them is via Twitter: @Valduccis-- they often have deals JUST for their Twitter followers, so get on it! If you've been reading this blog for a while, you already know that That Sara's birthday is two days before mine. We usually have a birthday dinner a month or so later to exchange presents and catch up on life. This year might have been our quickest one ever-- it was less than 2 weeks after our birthdays! We were both very eager to try out Murray's Cheese Bar, the fairly-new outpost run by the infamous (and incredibly amazing) cheese shop in NYC's West Village. I started with a bracing cup of Stumptown Roasters' iced coffee. Wow, was this strong. Like, jitters kicking in about halfway through the glass strong-- just what I needed to wake me up on a breezy Sunday morning. We each ordered the mini mimosa flight-- 3 small servings, a few ounces each, of (L-R) regular OJ, lychee, and blood orange flavors. These were all nice, but nothing amazing. It was more for the cuteness and the novelty of it. Fun, not too boozy, and just adorable. Who goes to Murray and DOESN'T order a cheese plate? Silly people, that's who. So we picked the Weekender ($10), a selection of 3 cheeses: housemade ricotta drizzled with clover honey, a rich, oozy brie with a cherry glaze on the side, and a New York cheddar with fresh apple slices. Of course, every cheese was a winner, every pairing just perfect, but holy moly that ricotta was sublime. 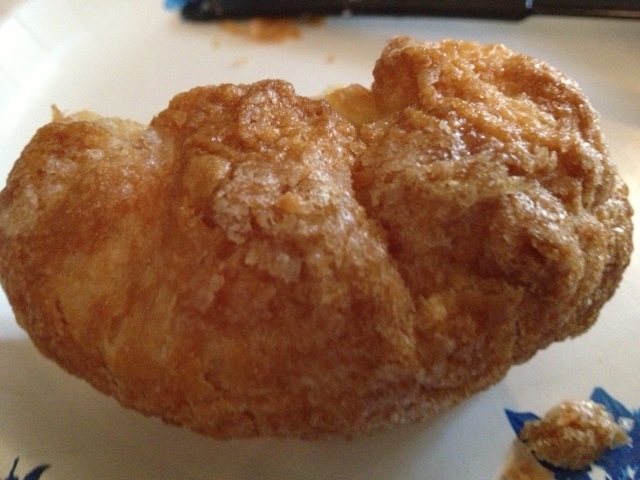 It was nothing like the storebought version-- it was light, fluffy-yet-creamy, and so fabulously flavorful. We shared the entrée-- Alpine Eggs ($14)-- to have room for dessert (or more cheese!) later. The Alpine Eggs were two poached eggs served on English muffins over ham and mushrooms, with a three-cheese fondue served on the side. YES. Who needs Hollandaise when you can have melty, creamy cheese over your eggs? The eggs were so so so perfectly cooked, the muffins were crunchy and not soggy, and I could have licked the bowl clean of that fondue. 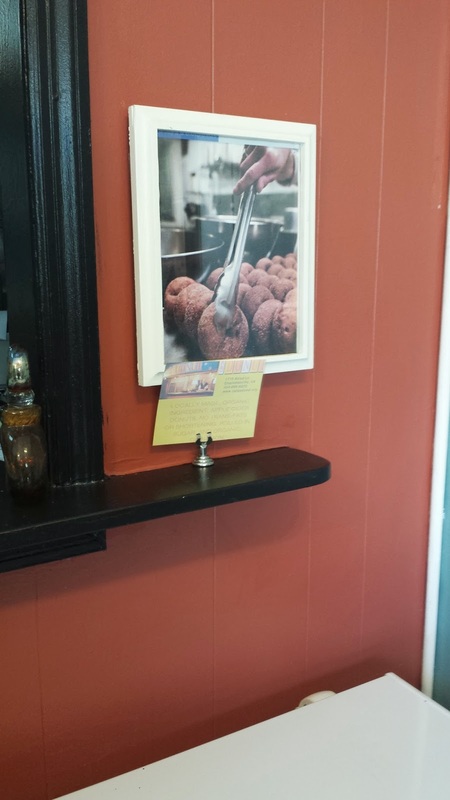 The home fries were also soft, expertly seasoned, and better than I expected. This was a wonderful, enjoyable, nommable brunch. The service was helpful, it wasn't too loud, and Murray's knows cheese, baby. They know CHEESE. Yum. I highly recommend this spot-- and then you can walk a few doors down and buy the cheeses you just ate! I need to stock up on that ricotta ASAP! Also-- check out Sara's take on it here! 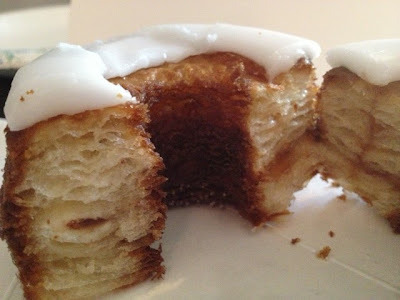 Welcome, new visitors, to Stuff I Ate! I'd love for you to like my Facebook page (click HERE!) and share the fun! No, I didn't skip any letters-- that's how the Mtblls truck spells its name! You won't care about spelling though when you get a taste of their product--what's not to love about meatballs? You can choose from beef, chicken, or veggie meatballs, and get them on baguettes, slider rolls, or with focaccia bread. The sauces are tomato, francese (lemon), or romesco (tomatoes/red peppers). 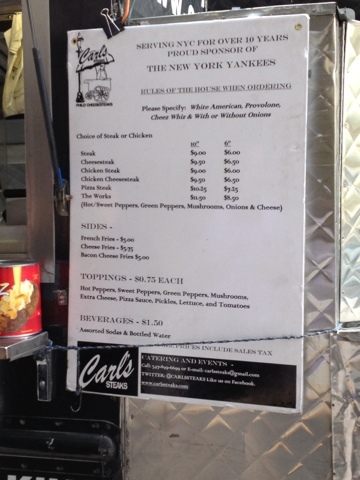 Nothing is more than 10 bucks at this truck, so file this baby under Cheap Eats! I ordered the 'pair of balls' (You're welcome, Mom) for $7-- two beef meatballs with tomatoc sauce, ricotta and parmagiana reggiano cheese, normally paired with focaccia bread. It comes in a nice, leakproof box, and was still warm by the time I got back up to my desk. They were out of focaccia, so they gave me a slider roll instead. I was disappointed at first, but that slider bread is FAB! Soft, chewy, so good! I ate every last bit of it, and used it to sop up the deliciousy zingy sauce, which had a wonderful heat in the background but was not overly hot. I thought the meatballs were great-- chewy but not tough, well-seasoned, and just enough to tide me over before going out to a fancypants dinner later that night. Follow them on Twitter- @mtblls to find out where they'll be each day. Today's guest post comes from my lovely coworker, CJ. 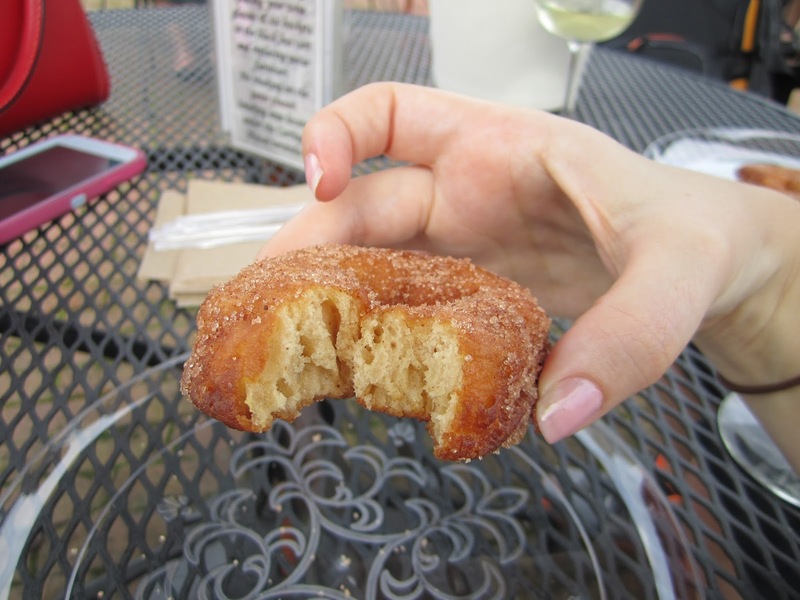 She's the one who first told me about Carpe Donut and their NYC cider donuts truck. She graciously volunteered to visit the VA outpost, near where her BF lives. She's a team player, that CJ! Hi there, LKP's co-worker CJ here. 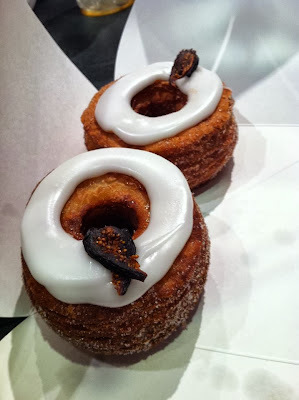 As you read a few posts back, LKP and I had a delicious experience at the Carpe Donut truck in NYC. 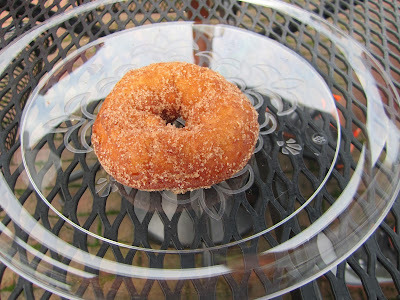 So when I next went to Charlottesville, VA, where Carpe Donut originated, I had to do a taste comparison. My BF & I decided to get some cider donuts as our brunch before heading to a day of lunching & polo at King's Family Vineyard. We packed up a nice lunch for ourselves and set off to Carpe Donut. 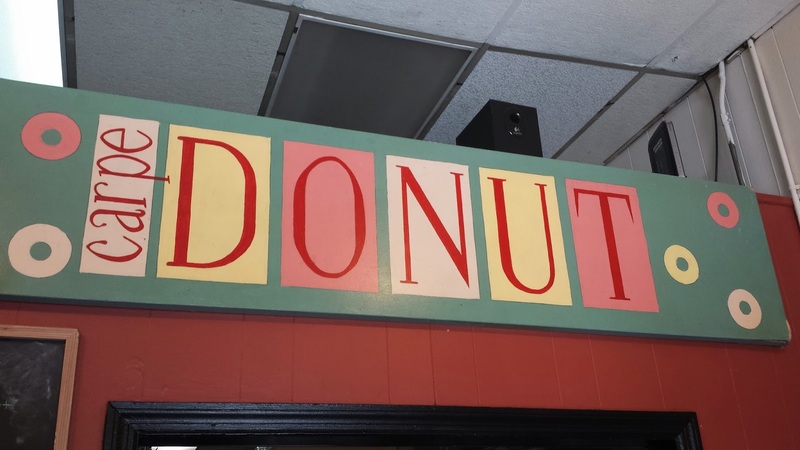 It was a small storefront, but easily fit the half-a-dozen customers looking for a yummy treat for breakfast. 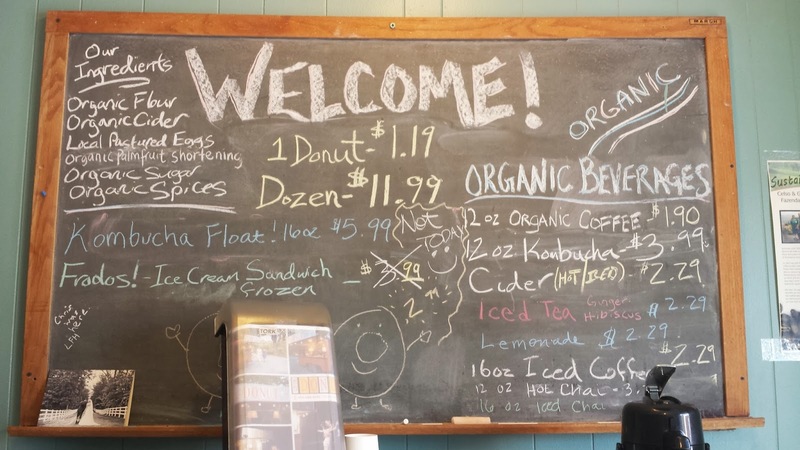 We placed our order for a half-dozen and two iced ciders, then watched as the magic happened. We got to see our donuts roll off the line and fall into the cinnamon sugar deliciousness where the donut maker tossed them a bit more before putting them piping hot into the bag. He grabbed a jug of the homemade iced cider from the mini-fridge and poured what promised to be a delicious glass of cider. 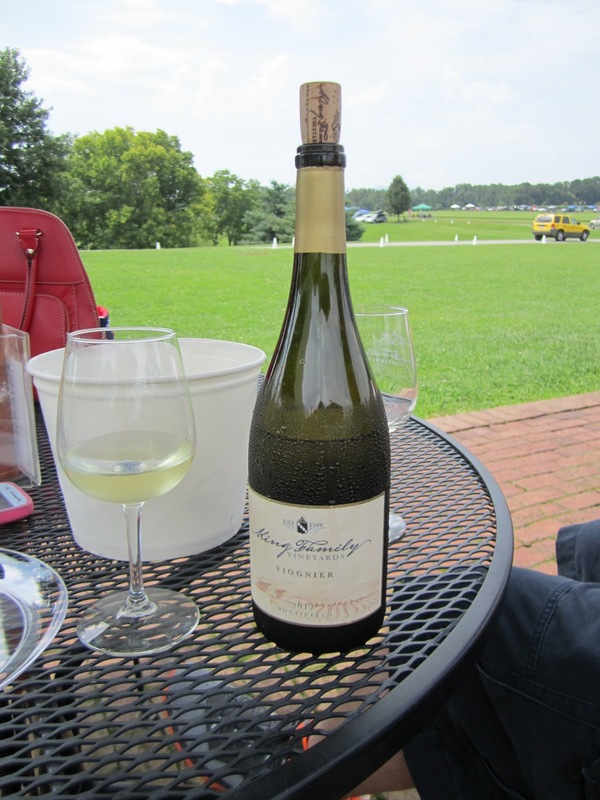 Our plan was to eat them when we first arrived at the vineyard, but we certainly couldn't wait that long! So we shared one in the car (spilling a lot of cinnamon sugar in the process), but it was so worth it! As with the NY truck, the donuts were chewy and not dense like many other cider donuts. 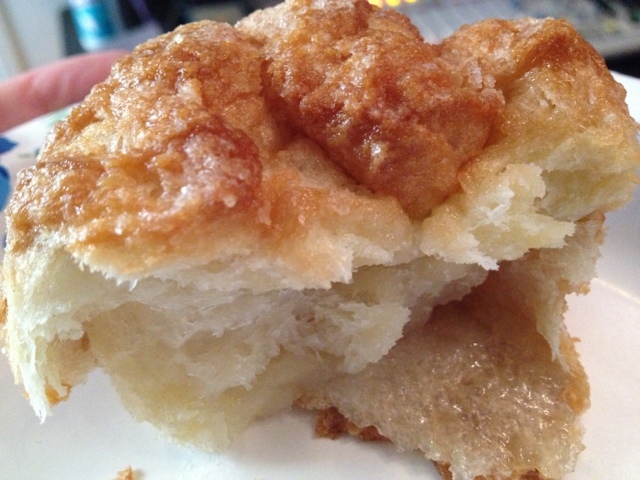 The cinnamon sugar is the perfect touch to create that apple cider taste. Our iced ciders were cool, refreshing and delicious. We drank them down quickly as we made our way to the vineyard. 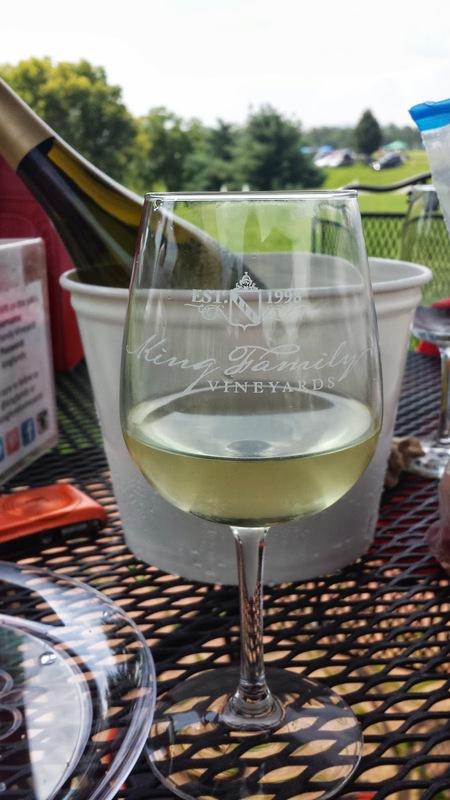 Once at King Family Vineyard, we bought ourselves a bottle of Viognier and set up our table to enjoy more donuts. 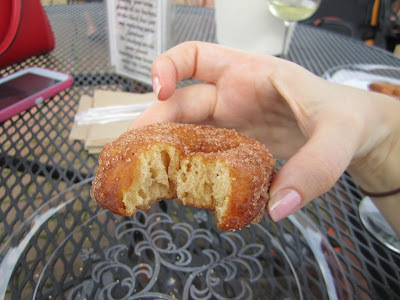 I found that the Viognier paired well with the cider donuts, it may be my new favorite brunch find! Even after cooling down, the donuts were just as delicious. They had a well done quality that added to the taste instead of detracting from it and were still just as light & tasty as when freshly pulled from the sugar. If you're in Charlottesville, I definitely recommend trying Carpe Donut and visiting King Family Vineyard for the polo game. 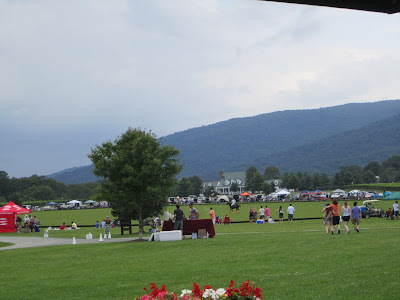 And although we really had no idea what was happening in the polo match (all of my knowledge of polo comes from Pretty Woman), it was certainly fun to say we were there while sipping our wine & enjoying our cider donuts. 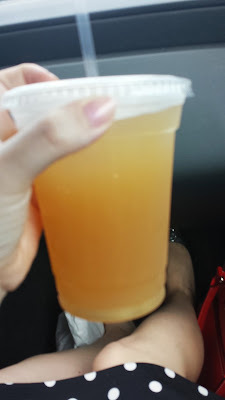 Welcome to a new segment on Stuff I Ate: Food Truck Fridays! 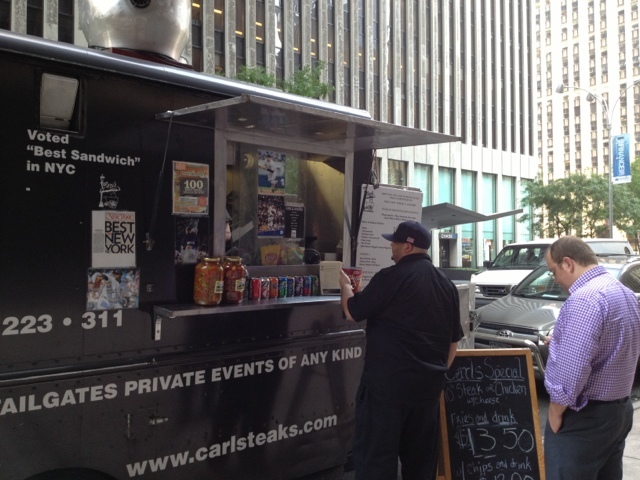 Every Friday I'll bring a new food experience from one of NYC's many delicious mobile meal options! 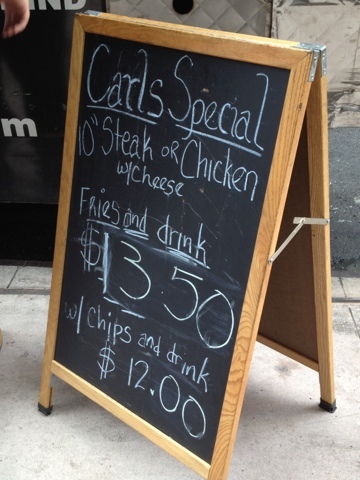 Carl's Steaks used to be a last-stop on many an evening out-- it was located on 2nd ave near many bars and dance spots, so we often went there for a late night snack to soak up some of our celebrating. 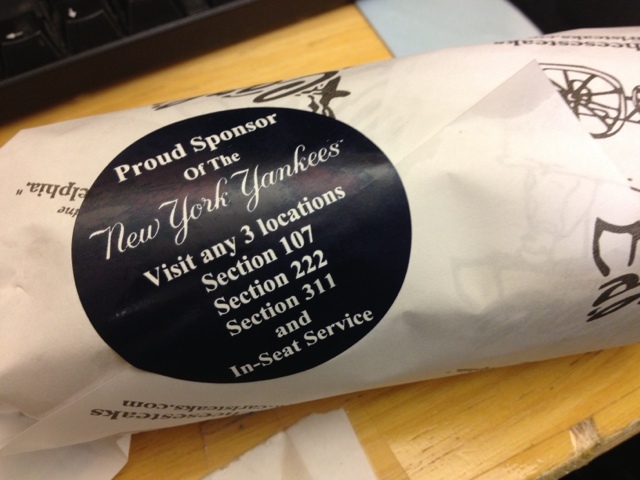 Even a Mets fan has to eat! 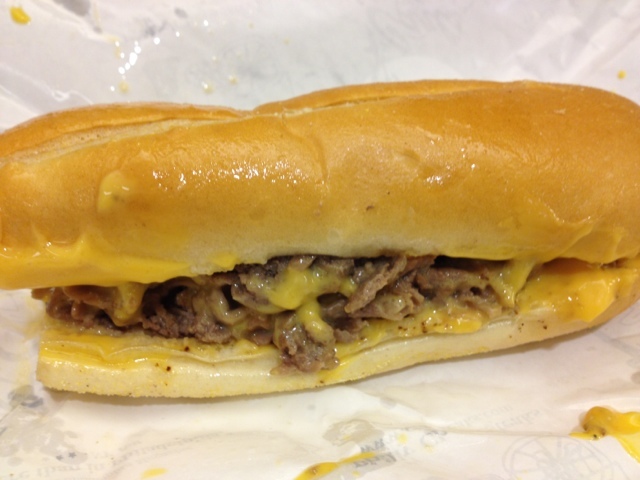 A 6-inch cheesesteak runs 6.50-- an excellent bargain, if you ask me. I'm a fan of the Cheez Wiz (this is the ONLY time I eat Cheez Wiz) and onions version, but you can also get peppers, hot peppers, and other toppings. There is also a 10-inch for not that much more, but the smaller sandwich is always enough for me. I've had the same sandwich twice now-- the bread is fresh but with a decent crust (not crispy per se, but not soggy either) the meat has been tender, and they don't skimp on the Cheez Wiz! My sandwich yesterday could have used more onions, but that didn't stop me from devouring the whole thing. I'll be swinging by next time to pick up a sandwich AND some bacon cheese fries. Yeah, you heard me. Several of my coworkers have already volunteered to help me finish them-- they're team players like that! The best way to find out where the Carl's Steaks truck is each day--- Twitter, of course! Follow them there @carlsteaks. 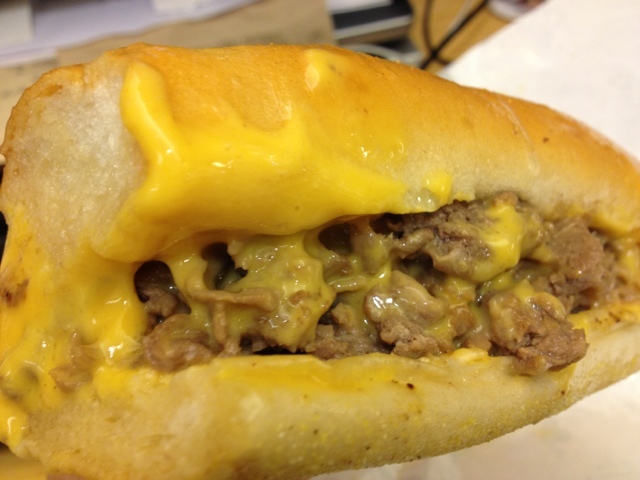 I'm not a board-certified cheesesteak expert, but I know good meat, good cheese, and good bread, and Carl's Steaks has all three! Track 'em down and tell me what you think!